Weighty Matters: If I Hadn't Seen It, I Wouldn't Have Believed It. Yet believe it I do. 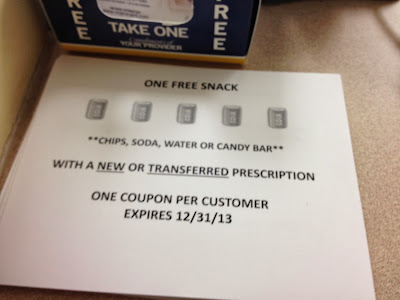 It's a photograph taken by a patient (who wishes to remain anonymous) whose physician works at Rockville Maryland's Spectrum Family Health Center where if you join their practice you too can redeem their coupon for a free bag of chips, a candy bar or a soda for any new or transferred prescription! Of course you could also choose to hightail it out of there as clearly the physicians there simply don't have a clue.